1. Lightweight hard anodized 6063 aluminum alloy reservoirs dissipate heat quickly and will not rust due to gas charging contamination. Several colors are available to match your vehicle. 8. Heat treated stainless alloy valve shims do not fracture like plain carbon steel and resist deformation at high temperatures providing consistent fade free performance. 2. 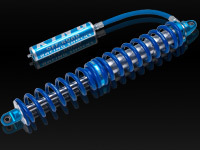 Our own truncated thread design produces ultimate strength and trouble free spring adjustments. Shock bodies are bored and honed after cadmium plating to ensure cylindricity and an efficient piston seal that enhances valve function. 9. Wear bands are made from a Rulon composite that offers incredible wear resistance, low deformation under load and high compressive strength. Overlapping end design enhances sealing. 3. 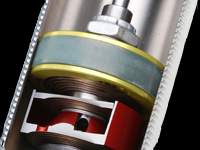 Pinch bolt design offers superior clamping force to retain your coil pre-load adjustments without crushing the threads like set screw style collars do. 10. Special long wearing urethane seals have been tested on 18 wheelers for 450,000 miles without a failure. 4. King coil springs are manufactured to our specifications in the USA using the finest quality, high tensile, chrome silicon wire available. 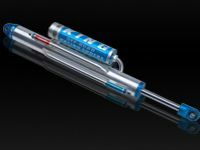 Spring rates, wire diameters and coil lengths have been developed through extensive real world testing on all types of terrain. 11. 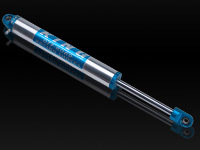 Large ¾" or 7/8" diameter shafts have a tensile strength of 100,000 pounds per square inch. They are hard chromed to combat rock bruising and micro-polished to a 6 RA finish for extended seal life. 5. 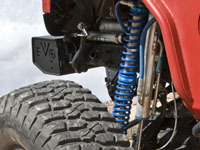 Composite coil sliders maintain proper spring alignment and silent operation. 12. Replaceable Teflon lined stainless steel spherical bearings will not rust and provide smooth articulation with no metal to metal contact. 6. 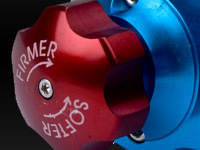 Progressive dual rate spring applications use lockable secondary nuts threaded onto the body to allow precise adjustment of secondary spring engagement. 13. High quality fittings are mated to Aeroquip high pressure hoses which resist abrasion and allow a tighter bend radius without kinking like braided stainless or cloth lines do. 7. 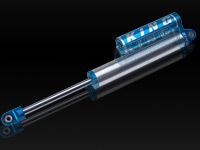 Highly developed port designs on our 6061 aluminum alloy piston provide the famous King ride quality.